I love this design. It's so fun and makes everything look classy. It took me a long time to get the pattern mostly straight but that's my own damn fault. Pretty gold is the Sally Hansen Color Quick color pen Gold Chrome. Pretty blue is Savina's Caribbean. The plate is Red Angel's #120. It makes me think of a Persian rug. The blue isn't quite as bold in real life. It appears much deeper, much more navy. Still gorgeous though! This design is so original! The Red Angel plates are really awesome. Love the colors too! Looks amazing! I love it, you've got talent. 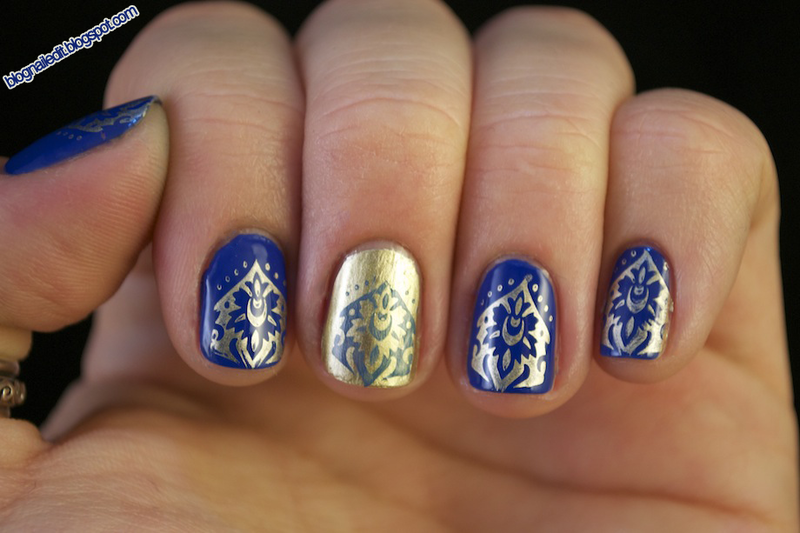 I love this Persian navy blue design. Gorgeous!